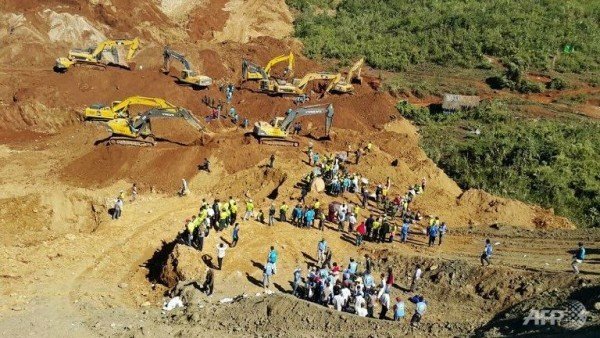 About 50 people are missing and feared dead after a landslide hit a jade mining region in Myanmar’s northern Kachin state. A search for survivors and bodies is continuing after Christmas Day accident in the area around Hpakant, officials say. In November 2015, more than 100 people were killed in the same area after a massive landslide. Jade mining produces piles of waste rock. Itinerant workers climb the heaps to search for the gem stone. The Bangkok Post quoted Hpakant official Tint Swe Myint as saying five bodies had already been found. “According to witnesses, about 50 people are still missing,” he said. However, Myo Htet Aung, another local official, told the AFP news agency that “just three or four people are missing at the moment” and no bodies were found at the site. In November’s disaster, many of those killed were people who made their living scavenging on or near the waste dumps left by large-scale industrial mining firms. In a report in October, advocacy group Global Witness said the value of jade produced in 2014 alone was $31 billion – the equivalent of nearly half of Myanmar’s (Burma’s) GDP – yet hardly any of the money was reaching ordinary people or state coffers. Local people in mining areas accuse the industry of a series of abuses, including poor on-site health and safety and frequent land confiscations.